ISLAMABAD: Finance Minister Ishaq Dar on Monday dismissed Pakistan Tehreek-e-Insaf (PTI) chief Imran Khan’s demand of including officials from the Military Intelligence and the Inter-Services Intelligence Agency in a judicial commission to probe Imran’s rigging allegations. 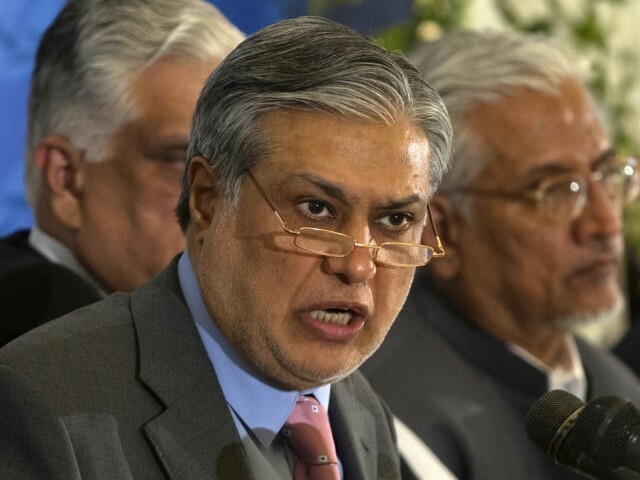 The finance minister, while addressing a press conference, said the government is still open to holding talks with the PTI, but only if the demands are “according to the law and Constitution”. Do you think officials from the MI and the ISI should be included in a judicial commission to probe Imran’s rigging allegations? What law says ISI or MI officials cannot be part of investigation? Were they not part of Model town investigation? If you won cleanly, what have you got to hide? Further losses are being incurred by the travels of the PM and his family, most of which are engineered for private use. Mr dar, whats the confidence with sharif and your family like? Are they finally going to start investing in Pakistan now? If they do, it will boost investor confidence..no? Really? Then why were they part of the Model Town probe? Oh, I see, they already showed the lies told by Non League to cover up one crime. Dar does not want ore headaches! Dharna is responsible for slow economy. Dharna is responsible for incompetence of PMLN Govt. Nobody cares about Dharnas but still its effecting badly to Govt.? presumed PMLN is bunch of liars. 100% agree with Dar that ISI, Army and MI can’t be part of any judicial commission. They are operational units With assigned duties and are not independent like judiciary. IK is not being rational here. I think it has sunk with him that the umpire has abandoned him. So Imran has been successful in sabotaging the investors confidence to invest in Pakistan. Well done Imran Khan and his company. Mission accomplished now please stop this drama and get back to the parliament and let Pakistan to move forward. The economic downturn is due to damage done to the economy by your buddy Mr Zardari’s five years of loot and plunder and a continuation of the same by your government………and you still refuse hold them accountable. It is the dharana that has put some fear into you’ll and has made you’ll a slight bit more responsible . Before Dharna investors were in queue anxiously waiting for investment permit. I have visited Pakistani Embassy in Berlin many times during last couple of years and hardly saw any foreigner in embassy. Even Pakistanis there were angry over government and officers. Investors are not interested to come due to your policies and your inept departments not because of Dharnas. Don’t make us fool. The government is open to any judicial commission that it can influence. No one doubts that the elections were rigged, more than enough evidence of that is already available. But the disenfranchised Pakistani public is powerless because the PM is supported by the international establishment which will not allow anyone that cannot be bought (such as Imran Khan) to lead this strategically important country. In the end, the family juntas supported by them will be kicked out (as it was for example in Vietnam and South Africa), and we the people will be victorious! PTI is not asking to engage Saudi Arabia, India or UAE – it is a local solution to local problems – one can’t understand why PML N is afraid of fair investigation? is this part of the deal with PPP to hate Pakistan Army? On one hand IK wants rule of law and believe in constitution and on the other propose things which are not in our constitution. How come the similar Joint Investigation Teams constituted several times in the past were constitutional and now such a set up would be unconstitutional? Remember the Model Town firing case investigation? You can say that IK is not being rational. But when your institutions get corrupted. What choice has a normal citizen got? My land was illegally captured by Land Mafia. Went to the Police, they said not to come back or to bring a lot of money next time. Went to the court an till date 25 years have passed and Court is giving me dates after dates. Welcome to my country! Imran supporters are so innocent that they don’t know difference between Enquiry Commission and Supreme Court’s Judicial Commission. Dear Kids, Supreme Court is the highest authority of the country and no Tom and Jerry can advise, suggest or challenge it. Grow up please. If COAS can be requested to mediate a political dispute, then why can’t MI/ISI be part of commission? If i am not mistaken, It was Dar’s suggestion in the beginning to include MI in the investigation. I don’t understand how cheap politics Noon & company is playing. Hope to see very soon the end of the dynastic politics and corrupt political mafia in Pakistan. The reason Chinese investor confidence is low, is not because of Imran and his fight for truth, but now the Chinese have also been told how this government has been and will be, operating. Even they have found out and realized from these dharnas what the present government is all about. This group of cronies is a bad example of the nation. The sooner they are replaced, the better the economic situation gets. What about just attacking the supreme court? Is that different to challenging it? Is this the same ISI that is accused of intimidating, torturing and occasionally assassinating journalist? Why in the world would anyone want them adjudicating anything? We need Military courts! as the Law enforcement and Judicial system is NO MORE!! The government has reservations over ‪#ImranKhan‬’s demand to include officials of ISI and MI in “Judicial Commission”, what about just changing the name to the “Joint Investigation Team”? If PM can call in army to facilitate the negotiations than what’s wrong in including them in the investigation team? For investigation purpose, because they (ISI & MI) have THE EXPERTISE in intelligence and investigation they can be part of judicial commission. Unless the sponsors do something spectacular this government is doomed. The PM is again globetrotting on tax payers money while children die in Sindh, innocent Christians are murdered in cold blood and the country has failed miserably to control polio. Not to add daily misery of awam on the hands of increasing electricity and gas tariffs and food prices. before commenting here if you all would have read some or part of the constitution you wouldnt be making ridiculous insinuations vis a vis ISI and MI. First of all ISI & MI are intelligence agencies not investigative agencies they have no purview in such matters and secondly article 225 of the constitution bars any court or any agency other than the election tribunal to look into matters regarding the constitution. Not easy to gets rid of these Buzzards……. in land of pure. Imran Khan has become irrational. @T Khan: Yes, trying to fight for free elections is ‘irrational’ in your books! If the SC & govt is sincere, then they can constitute IC ( Inquiry Commission ) same like made in case of Arsalan with Dr Suddle as 1 man IC. IC has more wider power than JC. 2) by default our judicial system follows exquisitonal procedure whereby the case is probed on basis of evidence submitted by the petitioner or prosecutor while in case of inquisitional procedure, it is incumbent upon SC to get the matter thoroughly investigated, collate all evidences, then start cross examination. Since, we are used to term JC, & then expects result, it will never come due to its basic structure. That is why all our past JC remained either inconclusive or half-baked, hence could never been made public, due to its inherent flaw. hence, IC & investigation by ISI / MI & adoption of inquisitional procedure is highly recommended. The govt knows that IK / PAT intends to press for IC & inquisitional procedure to adopted, that is why they are now jumping…they never expected IK / PAT to demand this…they thought that like past JC will bury the facts for good…no Sir No…it will not happen NOW. This is called CHANGE ! Firstly intelligence and investigation are two sides of the same coin. These agencies are far more superior then any other agency in Pakistan to conduct any kind of investigation. Whether you accept it or not this remains the fact. Secondly, you quoted one article from constitution and trying to become the lord of constitution, please do not do this and trust the opinion of Syed Sharifuddin Pirzada. He has categorically explained how this can be done. Please do not be a constitution expert. Regardless, of arguments and most importantly, constitution by virtue of its standing is a document which is developed to create resolutions and not to stop from getting a positive output which can be fruitful for the masses. On this note, I must state that the rigging investigation should be done all across Pakistan, that means also in KPK.